I have missed blogging so darn much. For the last couple weeks, I so badly have wanted to come to this place and just write. I miss the catharsis that blogging provides me, but between being tired from work, being tired for pregnancy, and being tired from wrangling my crazy little one year old, my brain is mush! However, what kind of mom would I be if I didn't document this milestone in my sweet firstborn's life?! I constantly have to remind myself how lucky I am to be doing something that I love, and that I have the best co-workers in the world, but the truth is, I've waited for a year now for my one-hour commute and being away from my kid for 50+ hours a week to be easier, and it just hasn't. I miss my baby boy, gosh darnit! We have been donezo for quite a while now. I find it hilarious that this is what I wrote in Charlie's 12-month update: "The only downside to this nursing pattern is that it's still preventing my cycle from coming back (TMI, I know), which in and of itself is not a bad thing. But Chuck and I have been talking about trying for Baby Pep 2.0 in the near future, so biologically, it does present a bit of a problem." Well, obviously I'm gaining that baby fat back! Despite what this picture may suggest, he was not actually pouting, but blowing raspberries! I swear, this kid went from crawling to running in 2 seconds flat! He's been walking since 13 months and hasn't slowed down for a second! Our little monster also has himself some teeth: two on the bottom, three on top, with the fourth ready to make its appearance any day now! Unfortunately, he can be a bit of a picky eater. He still doesn't like eggs, or pretty much any fruit or vegetable. He spits them out, even when we try to sneak them into other food. Sigh. But he does love yogurt, his fruit and veggie purees (go figure), french toast, macaroni and cheese, and basically any homemade cooking. Since I've been pregnant, sick, and tired, we haven't done much cooking at home, but I would like to step it up a little because he loves grown up food! Charlie and his cousin Lucie (who is 6 weeks his junior) are finally at an age where they're interacting rather than just co-existing. Charlie is so enamored with his cousin and loves playing with her, giving her kisses, and apparently, rubbing her belly, per his Aunt Ashlee's reports. When we're getting him ready in the morning and ask him if he wants to go see Lucie, his face just lights up. It's the cutest thing! 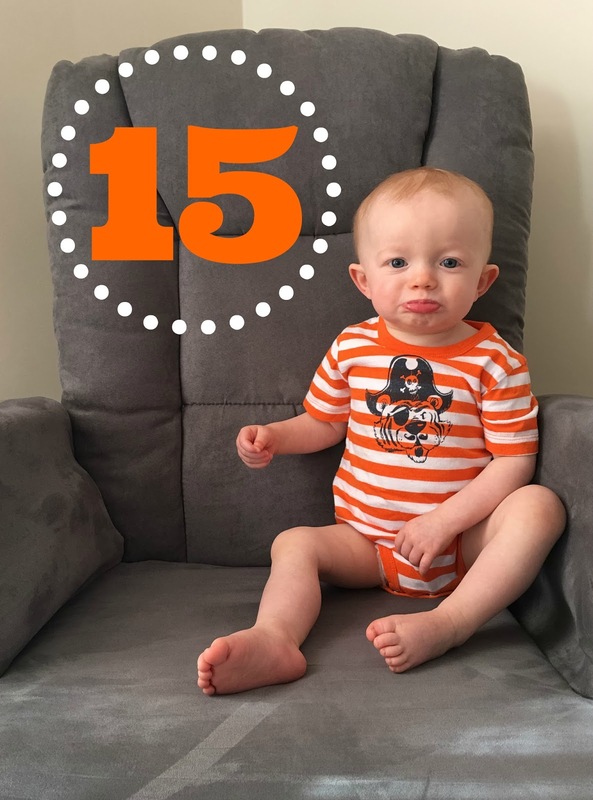 Charlie's 15-month appointment was yesterday and the nurse measured his height at 29 inches and his weight at 17 lbs 10 oz. I'm not sure where he's keeping it, but he's managed to put on two pounds since his 12-month appointment. So relieved that my peanut continues to grow! I am so looking forward to the coming summer months when I can stick this kid in just a onesie or a romper and send him on his merry way, because clothing continues to be a hassle. He's still wearing size 3 diapers and he's in between 12 and 18-month onesies and jammies. Pants are completely across the board, I just stick him in whatever will stay up on his skinny little waist, whether it be 6-9 month jeans or 12-month girls' leggings. I gave my Mom his measurements so she's going to custom-make a few pairs of pants that will hopefully stay up! He's in a size 3 shoe for now, but I just went and bought him some super cute size 4 Chuck Taylors, mocassains, and Tevas from Once Upon a Child. So cute!